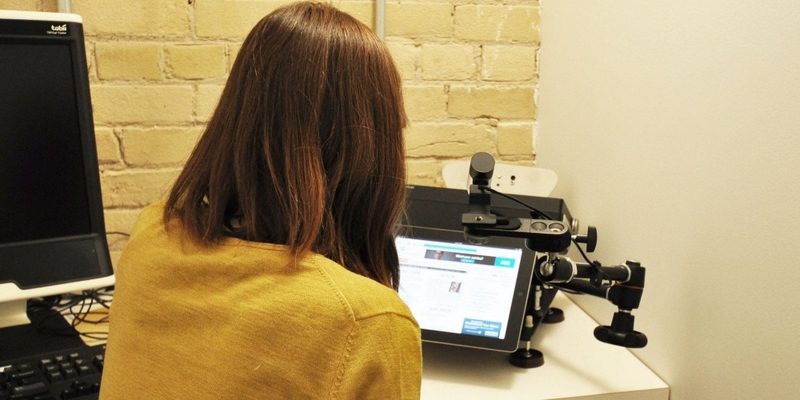 Mediative, a leading digital marketing company in Canada, used Tobii Pro's solution for mobile device testing in this eye tracking study to understand the full reach and impression of different ad formats on an iPad vs. a desktop PC. Eye tracking enabled researchers to study not only page views and clickthrough rates, but also the visual impact of different ad formats, measuring to what extent these were seen, how fast and for how long. Today's consumers increasingly rely on a growing number of online touch points and tools to make informed purchasing decisions. Digital strategists need to understand their customers' behavior as customers search the web, employ social media, visit an online store and react to an ad or promotion, whether on a desktop PC, tablet device or smart phone. Clearly there is a huge opportunity for advertisers to reach their audiences through tablets and smart phones as additional marketing media. But what do advertisers know about how the users of these new devices consume ads or promotions? Does the same ad format or design work on a tablet as on a desktop PC? Using Tobii Pro eye tracking technology in our research projects has helped us add an extremely important data point to our studies on advertising effectiveness. 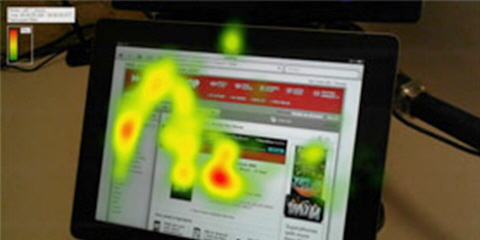 The aim of this eye tracking study was to provide insight into how people view web pages containing advertising elements in various formats on a tablet PC vs. a desktop PC. Researchers also wanted to measure the performance of display ad formats on different website verticals to determine if display ads perform better for one vertical category than another. 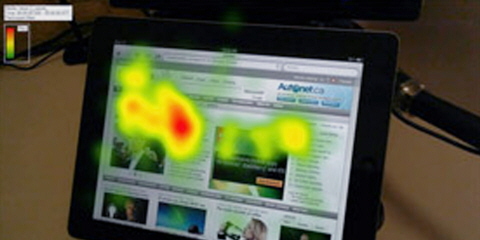 the differences, if any, in the views and glances captured by display advertising on a tablet computer (in this case, the Apple iPad) compared with a traditional desktop PC. how people observed web pages containing advertising elements in various display ad formats such as leader boards, big boxes, and skyscrapers. how display ads perform on different website verticals to determine if display ads on one type of vertical website perform better than those on another. 58 persons participated in the study. 31 viewed display ads on a desktop PC and 27 viewed the ads on the iPad. 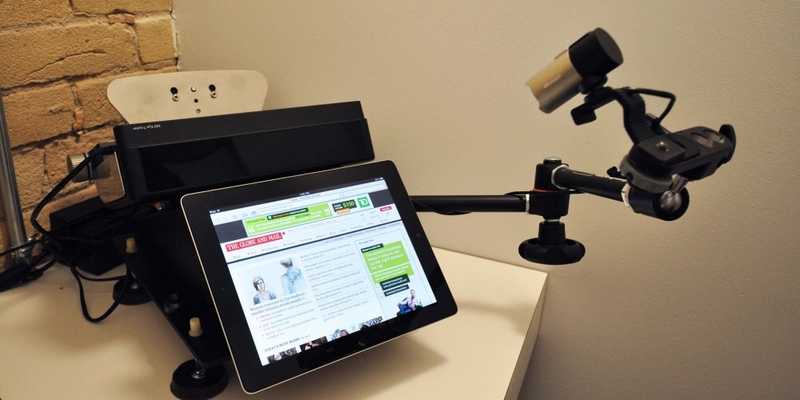 Eye tracking data was collected using theTobii X60 Eye Tracker, supplemented with the Tobii Mobile Device Stand for the iPad and the Tobii T60 Eye Tracker for the desktop PC. 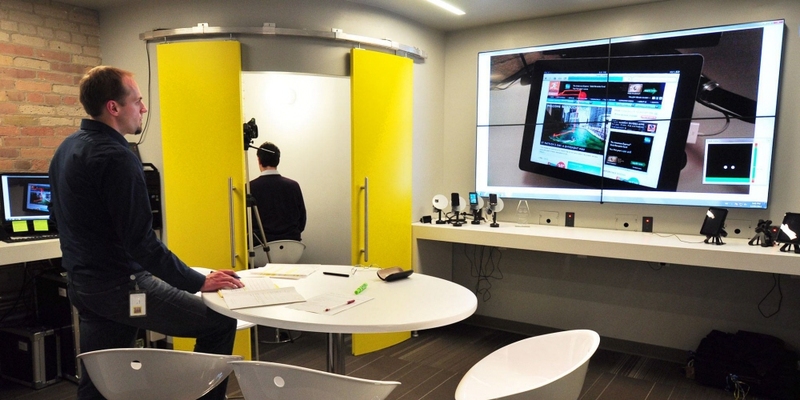 Tobii Pro Studio was used for analysis and presentation of the eye tracking data. Three different display ad formats were tested; leader boards, skyscrapers and big boxes. Ads shown on the web page represented eight different website content categories (verticals); automotive, entertainment, finance, lifestyle, news, retail, technology and travel. For each vertical, participants were given a task and asked if the site could help to give them the information they needed. Participants viewed five different sites in each vertical, and were given five seconds to view the page after it had finished loading. The order in which the verticals were presented was randomized between participants. 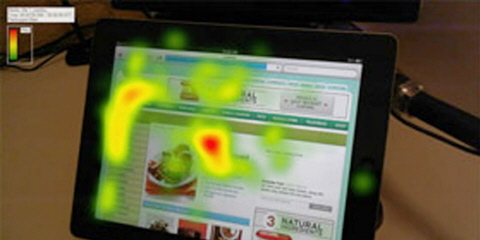 Researchers quickly saw how users visually perceived the websites and different ad elements. They were able to follow the gaze of the participants and experience the websites and ads through the eyes of the user, live during the test sessions. Generally speaking, all display ad formats on the PC outperformed the ad formats on the iPad for most metrics. Across both platforms, leader board ads were the best performing display ad format in terms of attention capturing metrics, thereby solidifying the notion that top and center ad placement remains a strong and privileged place to be. On the iPad, leader boards scored an average 24% faster time to first fixation, 15% fewer fixations before, and 16% higher participant fixation compared with the next best performing ad type. Leader boards on the PC had an average 45% faster time to first fixation, almost 50% of the fixations before, and were fixated on by 41% more participants compared with the next best performing ad type. On the desktop PC, leader boards were seen over twice as fast on average compared with the iPad, with less than half the fixations on other elements on the page before the leader board ad was noticed. A slightly higher percentage of users fixated on leader boards on the PC vs. the iPad (39% vs. 37%), but leader boards on the iPad held attention for longer, averaging 22.5% longer total visit duration. Fixation duration on leader boards compared with other ads on the iPad was over 12% longer, total visit duration was over 44% longer and visit count was over 13% higher on average. While leader boards performed best in terms of engagement metrics on the iPad,skyscraper ads performed better for engagement metrics on the PC. The skyscraper ad on the iPad was fixated on by 31% of users vs. 13% on the PC. However, the skyscraper ad was noticed more quickly on the PC, and held attention for an average of 82% longer. 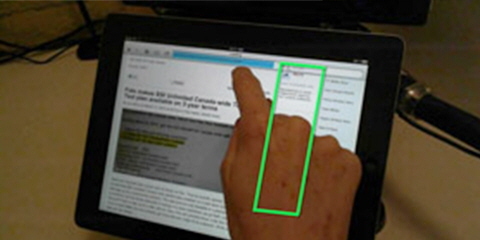 One possible explanation for the lower performance on the iPad is that there is a risk that skyscraper ads are masked by hands/fingers when scrolling. Also big box ads performed better on the PC than on the iPad. Of the users, 26% fixated on the big box ads on the iPad compared with 23% on the PC. Despite the higher number of total people fixating on the big box ads on the iPad, it was the ads on the PC that attracted attention more quickly, with almost half the time to first fixation and 35% fewer fixations before. Engagement with big box ads was also higher on the PC. Average fixation duration was 26% longer and total visit duration was 15% longer. Advertisers need to be mindful of the display ads they place online and the way they will most likely be consumed by the target audience. They should be conscious of where their ads are most likely to be consumed. If a large portion of the traffic to a website uses a tablet PC, they should consider investing more of their display advertising spending in leader boards rather than skyscraper or big box ads. Leader boards take up a large portion of the page (often the whole width) and are not likely to be masked by hands/fingers when scrolling. Tablet behavior may evolve, but given the physical dimensions of the device and the way users interact with it, it makes sense that this will continue to be an effective advertising unit. Overall, findings indicate that with a few exceptions, ads on a desktop PC are seen quicker and hold engagement longer than ads on an iPad. Therefore, the differences in design characteristics should be taken into consideration when creating display ad campaigns to optimize attention and engagement on each platform.